A call for a ban on lead fishing tackle and ammunition was recently rejected by the Environmental Protection Agency, which said there was no proof that it would protect the environment. Environmental groups petitioned the EPA in August to prohibit “the manufacture, processing, and distribution” of lead in bullets and fishing gear. In response to the American Bird Conservancy, EPA Assistant Administrator, Stephen Owens, cited steps already undertaken to curb lead use: limits on federal land, state regulation, education efforts and the increasing availability of non-lead alternatives. The EPA denied the ammunition portion of the petition two months earlier because the agency didn’t have authority under the Toxic Substances Control Act to regulate it. Already considered dangerous enough to warrant its own EPA webpage, lead can cause a range of health effects to wildlife, from acute poisoning and death to long-term problems such as reduced reproduction, stunted growth and neurological damage. Great Lakes state resource departments have approached the dangers of lead primarily through education. The Wisconsin Department of Natural Resources presented a plan for reducing lead impacts in October. It acknowledged the impact of lead on wildlife – poisoning has been reported in 15 species – and focused on education and internal measures to reduce it. The plan includes partnering with gun ranges to encourage non-lead bullets, expanding lead information on the DNR website and including lead training at hunter education courses. The department will reduce its own use by requiring non-lead alternatives for fishing tackle loaner programs and for ammunition used by DNR employees. The Michigan DNR website explains the devastating effects of lead on wildlife, specifically waterfowl. 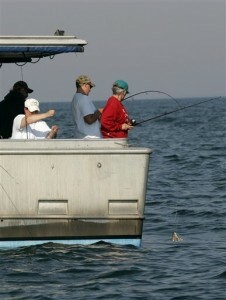 To target fisherman, the department has added a section to its annual fishing guide that suggests non-lead alternatives, said Jim Dexter, DNR Lake Michigan Basin coordinator. The Minnesota DNR has a “Get the Lead Out” section on its website that outlines lead dangers, and helps hunters and anglers find makers of non-lead bullets and fishing tackle. The only Great Lakes state to take regulatory action is New York. It bans the sale and use of lead sinkers weighing less than half an ounce. Many fishing and hunting organizations – including the American Sportfishing Association and the NRA – opposed the ban and welcomed the EPA denial. Those greater dangers include “fragmented and lost habit, and shoreline development,” Trotter said. The expense of non-lead alternatives was another complaint by Trotter, frequently voiced by others in opposition. The petitioners provided almost 500 peer-reviewed studies that proved the toxic effects of lead on fish and wildlife and was signed by the American Bird Conservancy, the Center for Biological Diversity, the Association of Avian Veterinarians, Public Employees for Environmental Responsibility and Project Gutpile. The ruling came down from the EPA right after the department’s “National Lead Poisoning Prevention Week,” an irony that Darin Schroeder, vice president of conservation advocacy for the American Bird Conservancy, voiced frustration over in a press release. “The EPA has chosen to ignore the unregulated pumping of lead into the environment for sport in the face of mountains of scientific data that say we are poisoning millions of birds each year, and now is asking us to be mindful of the poisonous impacts of lead,” he said. Harold is absolutely correct. However, it has been several decades since lead was banned from shot shells while hunting waterfowl. The non-toxic steel shot, bismuth and several other varieties are the norm now on all waters and even at inland feeding areas frequented by waterfowl. In addition, some states such as South Dakota require the use of non-lead shot while hunting upland game birds in both state and federal waterfowl production areas. All of these restrictions have sharply reduced waterfowl mortality from ingesting lead shot to an insignificant level. As to fishing sinkers and lead bullets, the EPA must not have found any significant impact. The argument against banning lead bullets has to do with the huge cost increase for non-lead bullets, altho manufacturers have designed non-toxic bullets that are claimed to be as effective as lead. I have no doubt that fishing sinkers could cause some mortality of waterfowl and even of fish, but, as a lifelong angler I doubt it is of any significance. The difference between the distribution of lost sinkers and formerly used lead shot in a given area of water is likely a factor of 1 in a million. I am an environmentalist and have supported several environmental organizations, but, not those listed, which have a radical animal rights agenda. Fred: Sorry, but you’re missing the point completely. Lead isn’t a problem because of it being a water quality contaminant. It’s a problem because lots of wildlife species INJEST lead and become ill or die. Plus, the lead shot that goes into our waters is not scattered over the entire surface of the Great Lakes, it is concentrated in near-shore marsh areas. This area of concentration is precisely where waterfowl congregate. Dabbling ducks, geese and swans are particularly prone to injest lead shot. In fact, a number of Trumpeter Swans which were released in southearn Michigan as part of the re-introduction program died within the first year. Necropsies performed on the swans showed they they had died from lead poisoning from the shot and sinkers that remained in their guts. A petition cited by Blue Eco Legal Council cited ~800 lbs (~.4 metric tons) of ammo being shot into the great lakes by FBI, Coast Guard & other branches of the military in one year alone. (Assume the mass of bullets is all lead). They then go on to state the effects this has on all the great lakes. The volume of the great lakes is 22.1 cubic km. One cubic km is 1 billion metric tons. So 800 lbs of lead in the great lakes is ~.05 ppt. Elemental lead, i.e. Pb in it’s metal form is insoluble in water. So do the math. Even if the FEDS continue to shoot up ammo into the great lakes at their current rate, it would take 600,000 years to add another quantity equal to normal levels of Pb in water. So what does this even mean? Nothing. Shooting ammo into the great lakes from a Pb poisoning point of view means absolutely nothing. Even if Pb was totally soluble instead of insoluble, it would still mean nothing. The post by Tyler is a perfect example of how good intentions, combined with naivety, lead to a completely emotional response to what is a benign situation. I am STUNNED that the EPA did the right thing here, especially in the draconian era of Obama. I would also like to add that Tyler should, as he states, “roll up the tent” on this one…. and go do something meaningful instead of dreaming of ridiculous regulatory fantasies. Has anyone considered raising an organized, GL Watershed-wide, direct appeal to sports-persons? I realize it is a marketing effort and not a regulatory push, but sports-persons have a stake in the game while nearly all politicians merely ante when the political climate dictates, then immediately fold when it cools. Steel shot had been around a long time now and alternatives to lead sinkers are available as well. In addition, maybe lend your name to manufacturers of alternatives to lead shot and sinkers by way of a published recommendation? There are just ideas to slow down the environmental damage during the painfully-slow legislative process which must be continually driven forward at its snail’s pace. It is more than unnerving that the EPA, of all agencies, would ignore more than enough sound evidence of the environmental damage. Even more considering we are (at least for now) in the Obama era. If the other guys take over again, we might consider rolling up the tent.